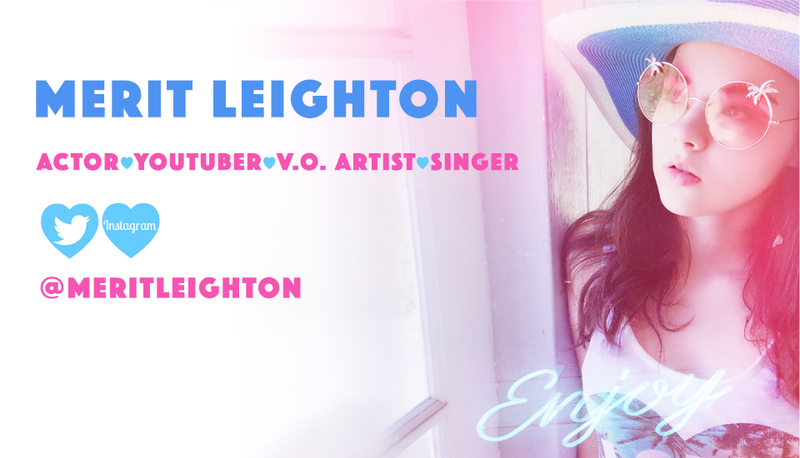 Merit Leighton is an actress, voice-over artist, singer, and Youtuber. Merit’s latest project is playing the role of Hannah on the upcoming Netflix comedy series “Alexa & Katie” starring along side Paris Berelc. She’s also recurring on Frosta in the Dreamwork’s reboot of She-ra and The Princesses of Power coming soon to Netflix. Leighton is most known for her recurring role as the voice of “Lucinda The Witch” on Disney’s hit show “Sofia The First,” she also lends her voice to the lead character of the show Sofia, on apps, games, and toys. Over the past year, Merit has quickly become one of the most versatile young YouTubers with her show KawaiiHappii, capturing her viewers with her crazy adorable personality and #virtualhugs. On KawaiiHappii, she has posted over 70 episodes since March of 2016, she’s a vlogger, gamer, and influencer. Most recently Leighton has become a “Nintendo Brand Ambassador,” vlogging from exclusive Nintendo events. Leighton’s other acting credits include a series regular role in the new media comedy "40's and Failing,” as well as the pilot "Dad Dudes,” other roles include NBC's "The New Normal" and "The Pete Holmes Show" on TBS. Aside from her work on TV & in New Media, she has simultaneously made her mark in the world of film starring as Doreen Portman in "A Tigers Tail" with Greg Grunberg and has also had roles in "The Lost Medallion”, "RA Resident Advisor" and "Monster Slayer" for USA Network, co-starring alongside Alicia Goranson and Timm Sharp. Merit is attached to play Gretchen in the upcoming indie feature “Gretchen’s Two Mom’s are Dead,” written and directed by Caskey Ebeling. Merit is also a professional singer, her vocals can be heard on two tracks for Disney Jr’s “Halloween Party CD” being released in 2018. She has recorded at Capitol Records singing back-up for Halsey on the Platinum single "New Americana,” had the honor of performing with a 50 piece orchestra, conducted by Lorne Balfe on the “SPIKE Video Game Awards,” and works as a session singer on many the projects such as, "Saige Paints The Sky", "Despicable Me 2", “AnchorMan 2”, “The Healer”, ”The World Cup Song” and more. Originally from Los Angeles, Merit began acting when she was five years old. Scouted by a manager from a picture on the internet Merit has been working ever since. In her down time, Leighton enjoys dancing, K-pop, Anime, video games and, watching old movies. She loves Japanese culture and is learning to speak Japanese. Leighton has a big place in her heart for charity work and is a celebrity youth ambassador for The Jonathon Foundation, a non-profit organization that addresses the needs of children with educational, emotional, and behavioral challenges. Merit currently resides with her mom, dad, and sister Marlowe Peyton in Los Angeles. Copyright © 2016, Merit Leighton. All rights reserved.